← Ever Wonder Who the CIA Is Following on Twitter? Why Are the News Media Ignoring Evan Falchuk? Is it just us, or is the Massachusetts news media ignoring at least the subhed from last night’s election results? The independent candidate for governor didn’t even come close to winning, but he captured enough votes – 3 percent – so that his United Independent Party can get official recognition and field legislative candidates in 2016. Right – but can we also stipulate that Falcuk’s 3% came largely out of Coakley’s hide? Do the math: without Falchuk (and 1.4 million of his own dollars) in the race, don’t the bulk of his 71,091 votes go to Coakley? Or are we missing something here? But only Falchuk might’ve tipped a race. This entry was posted in Uncategorized and tagged Boston Globe, Charlie Baker, Daniel Factor, Evan Falchuk, Googletron, Green-Rainbow Party, Ian Jackson, Martha Coakley, MassLive, MK Merelice, Shirley Leung, The Republican, United Independent Party. Bookmark the permalink. 12 Responses to Why Are the News Media Ignoring Evan Falchuk? I read his entire website trying to get a handle on him. Seems to be all about single-payer health care. His supporters all over town were college kids. If more than .01% of his votes could possibly have been for Baker I’d be shocked. Interestingly, he comes from the health care industry. “can we also stipulate that Falcuk’s 3% came largely out of Coakley’s hide?” If you have data, then yes. Otherwise, I don’t think you can. How many of those people would have stayed home or left the line blank? 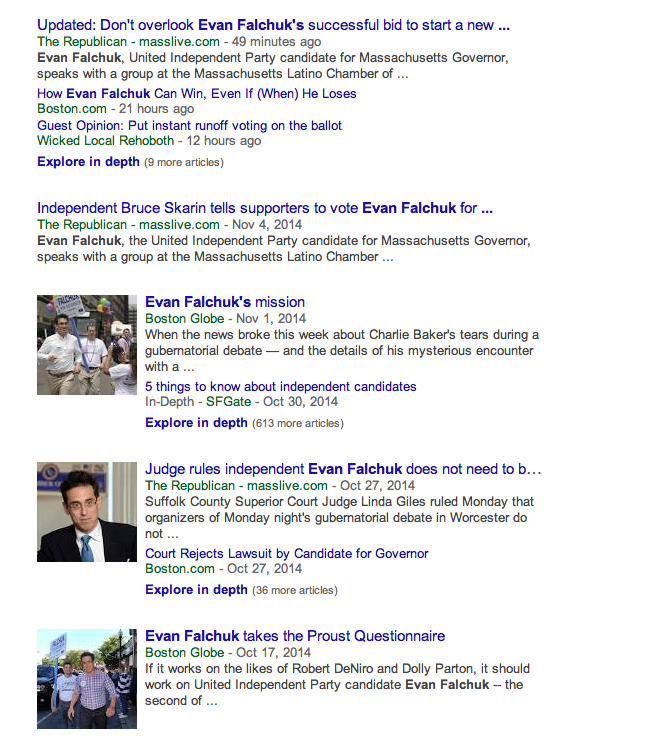 With a race so close, would someone who seriously preferred Coakley to Baker really vote for Falchuck? Without some exit poll data, it sounds like people are substituting speculation for fact. Fair enough, Steve. So “let’s speculate that Falchuk’s 3% came largely out of Coakley’s hide,” because I find it hard – but not impossible (just to save you a few pixels) – to believe that some chunk of those 71,000 wouldn’t have cast a clothespin vote for Coakley. But I could be wrong. Let’s talk after the data filter down. No detail, but if we’re looking at Falchuk voters it would be a sample size of 25 which might not be enough to know. The 3rd-party model I like best was based on Perot 92, who got 19% – enough to get a good sample. That vote broke down approximately: half would have not voted, 1 of 3 would have gone for Bush, 1 of 6 for Clinton. It’s a completely different context, but I think it says something non-intuitive about the 3rd party voter mindset and gives a guide to just how close an election must be before a 3rd party really influences it. Even though the election is being reported as “48-47”, the margin is really almost 2 points. I think that’s too big to blame on Falchuk. I think a larger place to look would be those registered Ds who just stayed home. Just my guess, that’s something that can be shown with data, comparing turnout with ’10. Social media is full of lefties bragging about voting for Falchuk. Same types – and probably the same ones – who defended voting for Nader. Same claim, too: The Dem candidate wasn’t progressive enough, and they’re doing us all a favor. It’s a personality disorder. 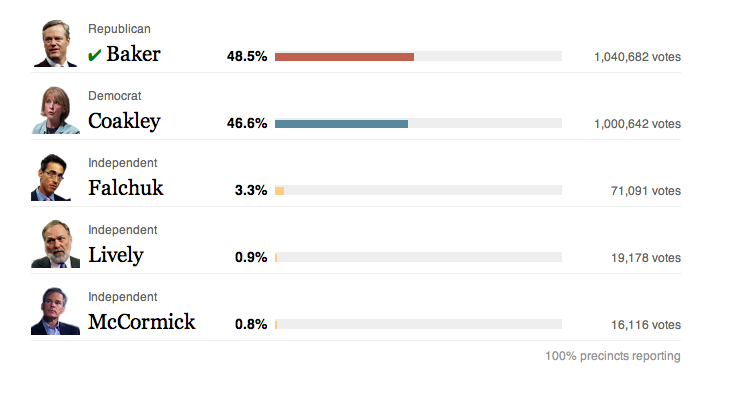 If more than 55,000 of Falchuk’s votes had gone for Coakley, the numbers work. That seems not too likely. And that ignores the 20000 votes for Lively, somewhat more likely to have gone to Baker. I dunno, Bob – looks to me like 41,000 would do it. Still a stretch to be sure. As for Scott Lively’s 20,000 votes – they’re going nowhere but church is my guess. Nope, 41K for Coakley leaves 30K for Baker, and Coakley still trails by 30K. Unless you want to speculate that nobody who voted for Kalchuk would have voted for Baker, which is pretty speculative speculating. So Lively supporters are staying home, but Falchuk supporters were going to vote for Coakley. This is making less sense every day. It was a joke, Steve. Compare the voting in Revere to Cambridge, both towns that Coakley won. Falchuk pulled Coakley votes. It holds true all over the state map. Your conclusion that falchuk was a spoiler is incorrect. It presumes that every registered voters actually voted. With the SOC predicting approx. 54% voter participation, it cannot be concluded that falchuks 3.3% came from either candidate. It is far more likely that falchuk drew from voters who may not have otherwise participated.